What better way to spend a Thursday evening than catching up with a friend and filling your belly with delicious food from around the world? Last night my friend Charlotte and I took a race over to Tobacco Dock in Wapping for the opening night of Taste of London’s Winter food festival. Built in the early 19th Century, the Dock’s main purpose was to provide safe and secure storage of, you guessed it, tobacco imported from the New World. It was relaunched under new ownership in 2012 and has become a go-to exhibition space for the city. Despite the cold weather food fans came out in droves making it their mission to sample as much as the top button of their jeans would allow. I had won a pair of tickets to the event from Time Out magazine so we didn’t have to pay the £25 standard entry fee – £19 if you buy in advance – leaving us with more money to spend on food and drink inside – hurrah! We picked up our tickets fairly easily and made our war through to the registration room where we joined a hungry herd of customers trying to figure out how to activate their ticket. This was definitely the most frustrating part of the process. In order to be able to buy anything you need to pay via your ticket which you register on an iPad upon arrival. You then have to wait for a registration email which will activate your card and mean you are ready to upload credit called ‘crowns’ with which to pay for your food and drink. You can either do this by entering your card details online or going to one of the many crown booths dotted around the festival. We, like many other visitors, had problems activating our cards initially and didn’t want to enter our details online so we just queued up at the booths and swapped our hard earned mula for crowns. I have no idea how we would have managed this process had we not both had smartphones. 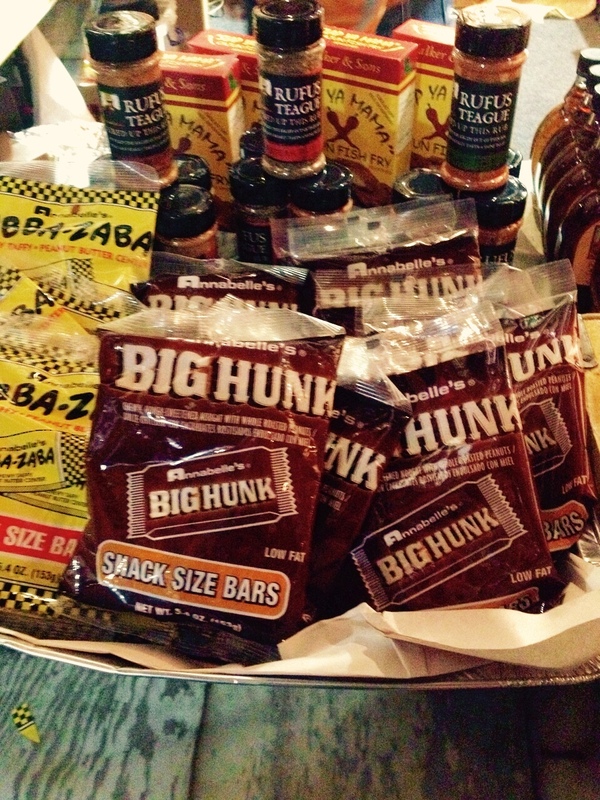 Once we were in we were chomping at the bit – (expect more puns of this ilk) – to get stuck in. First stop: gin o’clock at Sipsmith where we warmed up with a delicious mulled sloe gin. So good in fact that I had a second later on – no pics I’m afraid. Was too busy focusing on the task at hand. The venue itself seemed a little out of the way at first glance but was in fact really easy to get to with the Overground. From the station it is so easy to find. Follow Wapping Lane for 5 minutes and your there! The space lent itself very well to the festival with a huge variety of food and drinks stalls around every corner and across two levels. We noticed there seemed to be more drink than food stalls throughout but overall a great selection. It’s a wonder we were able to resist this! There were also a number of masterclasses with the professionals, an abundance of free food and drink, a toasty firepit, acoustic music and a DJ set to keep guests entertained. Alex James (former Blur bassist, now cheese maker extraordinaire) even gave the decks a wee spin for posterity. 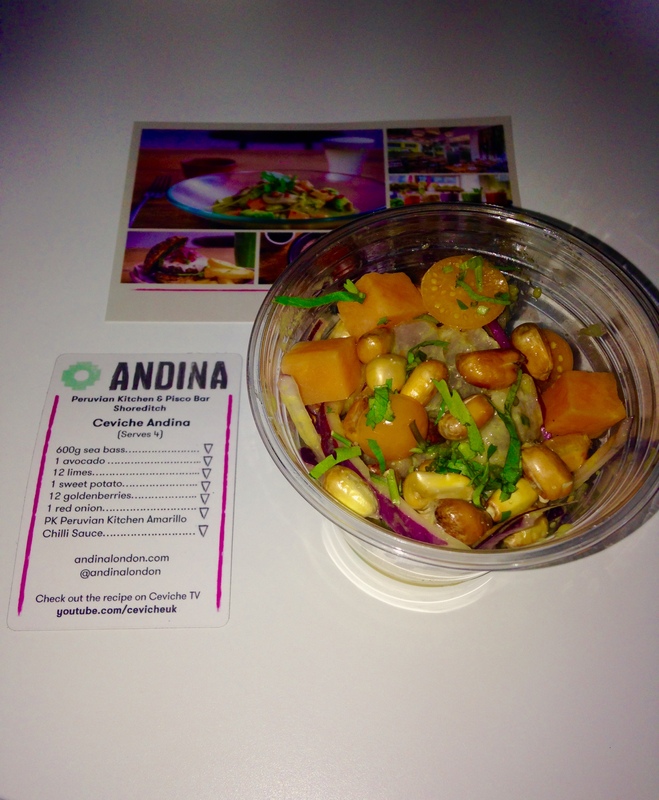 In the spirit of trying new things, (and a little emboldened by my earlier tipple), we headed to Andina for some Peruvian delicacies. I opted for the sea bass ceviche – fish not exactly cooked, cured maybe, in no less than the juice of 12 limes tossed with red onion, avocado, sweet potato and avocado. 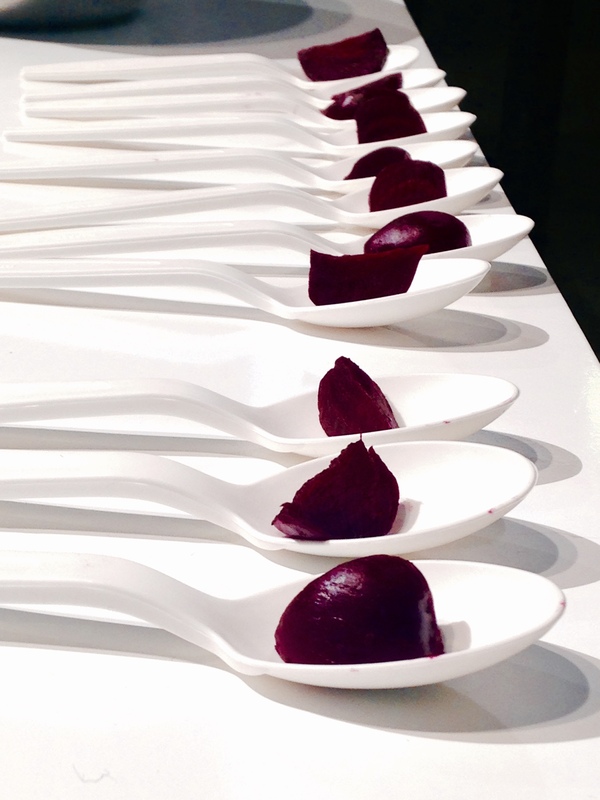 The texture was unlike anything I’ve ever tasted – chewy but not rubbery; tangy and a bit of an assault on the senses. I liked it! The lady at the counter gave me the recipe for it but I think her faith in my culinary abilities far exceeds my own so I might just leave it to the professionals and book a table at Andina instead. After pootling about, learning – and forgetting – which wine goes best with blue cheese, (a Spanish red of some description), we decided to take some goodies home with us. 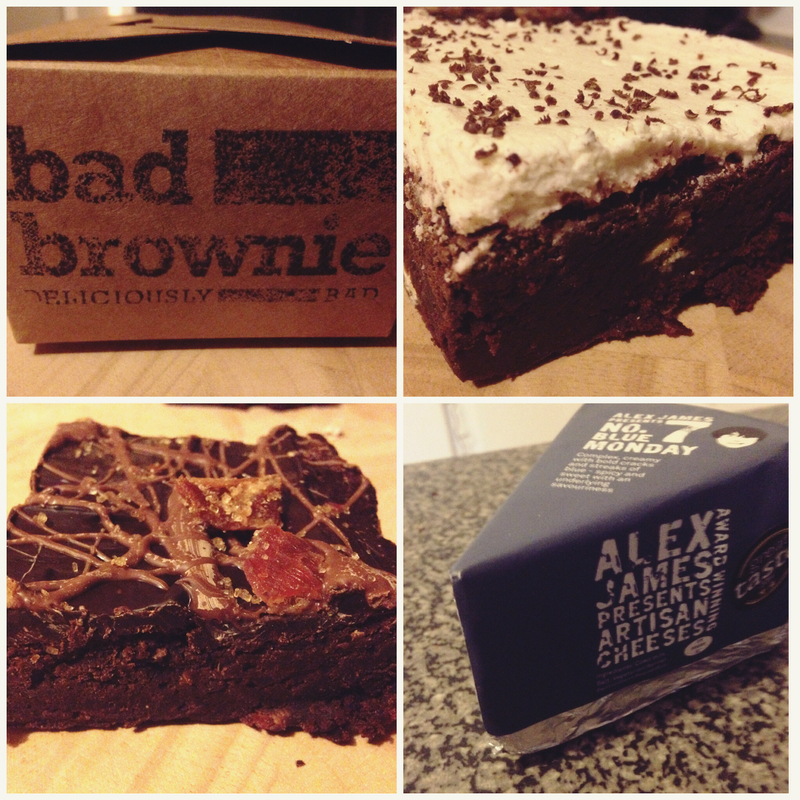 First stop, East London’s own Bad Brownie. With a regular stall at Saturday’s Broadway Market that I’ve been meaning to get along to for ages, they are super popular and have recently been voted the best brownie in London – imagine having a job where you get to taste baked goods all day? WOW. I opted for one of their famous maple syrup and bacon brownies and a chai latte brownie. Sadly – or perhaps fortunately for my waistline – their crown machine wasn’t working so we weren’t able to buy anymore. I’ve been saving them for tonight’s train journey to York and I’m quite frankly amazed they are still in tact. They smell so good! Of course, we also had to buy some of Alex James’s Blue Monday cheese. I had some on an omelette today and it was delicious – tangy, creamy, a little sweet. Who’d have thought Alex was really contemplating owning his own dairy back in the days of Country House?! Awkward registration process and temperamental card machines aside we had a really fun time soaking up the atmosphere and tasting amazing foods at Taste of London. I think it would have ended up being a very expensive night had we had to pay for our tickets but that said it would be a great place for a special occasion – a pre-Christmas catch up with the girls (or boys) instead of going to a traditional Christmas Dinner party maybe? Best get there early to take full advantage of the amazing food and drink on offer. Wear loose clothes for maximum sampling ability! 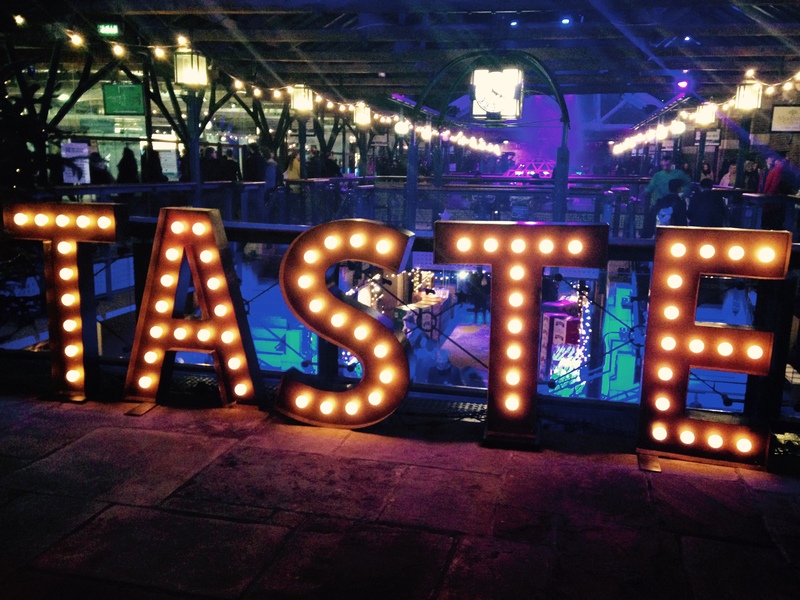 Taste of London Winter Festival runs until Sunday 23rd November. Tickets available here. Fancy winning a trip to the most magical place on the planet?